The Robbins Main Beam TBM, dubbed “Driller Mike”, was launched on Atlanta, Georgia, USA’s Bellwood Tunnel in October 2016. The Robbins TBM is now excavating in granite, with at least 300 m (1,000 ft) of zones in three separate areas that will require continuous probing. In a section directly below an existing reservoir, monitoring will be particularly crucial to ensure no water inflows occur. The Robbins machine will also be required to negotiate several curves: “We have one curve in the first 300 m (1,000 ft) and the main 370 m (1,200 ft) radius curve is 1,800 m (6,000 ft) in. We plan to do short TBM strokes in this section—about 20 cm (8 inches) to 30 cm (1 ft) shorter than normal to get through the curves,” said Larry Weslowski, Tunneling Superintendent for the PC/Russell JV. Excavation is scheduled to be completed in the first quarter of 2018. 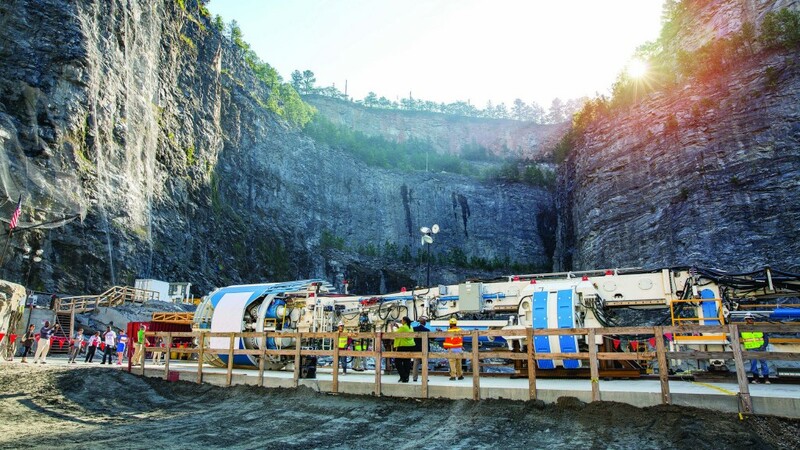 After final lining, the tunnel will be filled with water and the quarry site will become Atlanta’s largest reservoir and park, totaling hundreds of acres. While the park site is a bonus for residents, the water storage capacity it will provide is critical. Nearly 1.2 million customers, including 200,000 passengers who pass through the world’s busiest airport every day, count on the water supply each time they turn on the tap. “If the city were to lose water supply for a day, the estimated economic impact would be at least USD $100 million per day. If you consider that this is a USD $300 million project, that seems a pretty good investment in comparison to what could happen,” said Huie. Robbins Field Service stand proudly in front of the completed Main Beam TBM after an Onsite First Time Assembly lasting just 2.5 months. The 3.8 m (12.5 ft) diameter Robbins Main Beam TBM will bore the 8.0 km (5.0 mi) Bellwood Tunnel through granite rock with potential zones of water inflows. Atlanta Mayor Kasim Reed (left) and Atlanta City Councilman Andre Dickens (right) attend the TBM’s launch ceremony to kick off the Bellwood Tunnel excavation.